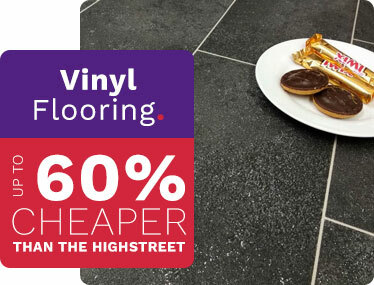 Vinyl floor covering is a fantastic alternative to solid wood or tiles, at a fraction of the price and with more durability. Here at Factory Direct Flooring, we offer two main types; cushioned or luxury vinyl tiles. Browse our lino collection below or read on for essential information, such as how to install and care for your floor. Vinyl flooring is one of the cheapest floors on the market. Not only that, but it is also the easiest to install, meaning you can effortlessly replace your floor yourself if it undergoes excessive damage. However, the chance of it suffering irreparable damage is unlikely, as this type of cushioned vinyl flooring can be both stain resistant and waterproof. This is why a vinyl floor or lino flooring is often recommended for rooms which see a lot of moisture, such as bathrooms or kitchens. Where Should I Lay a Vinyl Floor? Because of the versatility of vinyl, it is suited to every room of the house and even commercial spaces. The best flooring for such areas is heavy duty commercial vinyl which has been designed to last longer in high traffic areas. This flooring is particularly suited to rooms which see excessive moisture. Vinyl tile flooring works brilliantly as your bathroom flooring solution, as other flooring types may not last long in such a humid environment. These floor tiles also work well for kitchen flooring which are often exposed to splashes of food and water. Specially designed water-resistant vinyl floor tiles are the best for these rooms. This type of lino flooring is available in a wide variety of colours, textures and designs. For example, you can get vinyl wood flooring, which imitates solid wood but significantly cheaper. Vinyl tiles is also available, which easily replicates the look of tiles while being softer underfoot. Vinyl flooring rolls are the easiest type of flooring to install by yourself. Take your new flooring out of its packaging and allow it to acclimatise in its new environment for 24 hours. While this is happening, prepare your subfloor. Ensure it is clean and dry. Because floor vinyl is soft, bumps will show once your flooring is installed – a subfloor will prevents this. Once your floor has acclimatised, cut your floor to the size of your room. It’s recommended to add an extra 15cm to your dimensions in case you run short. This can always be trimmed away afterwards. Lay your sheet of vinyl flooring over the subfloor. Your method of sticking the floor down depends on the size of the room. For a small room of 12 metres squared or less, you can get away with loose installation, where no glue or tape is required. For rooms between 12 and 25 metres squared, it’s recommended to use tape. A double-sided tape underneath the sheet of vinyl floor covering will suffice. For rooms over 25 metres squared, glue is best to keep the cushioned vinyl flooring in place. After fixing your flooring down, add skirting or beading around the perimeter of the room. This can be fixed with a hammer and nails. While lino flooring is the easiest type of flooring to care for, it still needs a little TLC if damage is to be avoided. Most of these are precautious methods to avoid damage. For example, it’s helpful to use a flooring covering such as a doormat to avoid any dirt getting in and scratching your floor. With any heavy furniture, you can place padded floor protectors underneath – for example, under the legs of chairs that could tear your vinyl floor tiles. When it comes to cleaning this flooring, water and a mop will do the trick. If you want an extra sparkle, a mild cleanser will help clean without damaging the floor. If you are unsure which flooring is best for you, please take advantage of our free samples and test them in your home. Alternatively, if you have any further enquiries regarding our range of flooring, please don’t hesitate to contact one of our flooring experts by calling 0330 100 00 15.